Tablet Guides: Free to rent! The Audio Guide with subtitles, "Visual Search" developed by NTT R&D and many more. Report on the special event for the 26th Musashino Sakura Festival held on Sunday, April 1st, 2018. 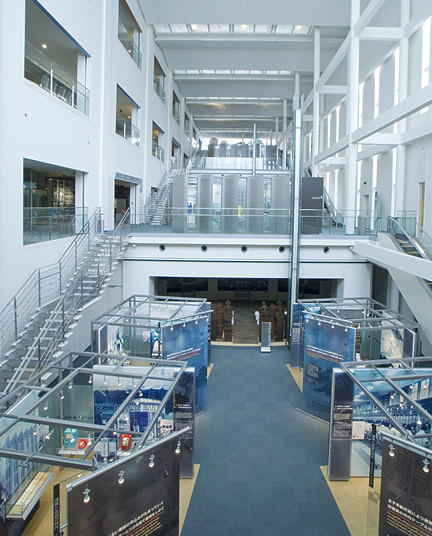 The NTT HISTORY CENTER OF TECHNOLOGIES is an archive of historical assets mainly consisting of the NTT group companies' huge collection of technological artifacts to be handed down to generations in the twenty-first century. Since the start of telegram service in 1869, the telecommunications business in Japan has undergone significant changes, starting with the Ministry of Communications, which then became the Ministry of Telecommunications, Nippon Telegraph and Telephone Public Corporation, and finally, following privatization, the current NTT group. A continuous stream of technological innovation has supported this history of Japanese telecommunications spanning over 100 years. The NTT History Center of Technologies exhibits in timeline fashion a collection of historical assets of the NTT group, accumulated as the result of the group's development of telecommunications technologies, with particular focus on the half-century since the foundation of the Nippon Telegraph and Telephone Public Corporation. Various lessons may be learned from the ingenuity and hard work of the pioneers who developed original technologies to answer evolving social needs amidst intense international competition. It is thus hoped that this center will be a source of inspiration for innovators working on new technologies to usher in the next age.